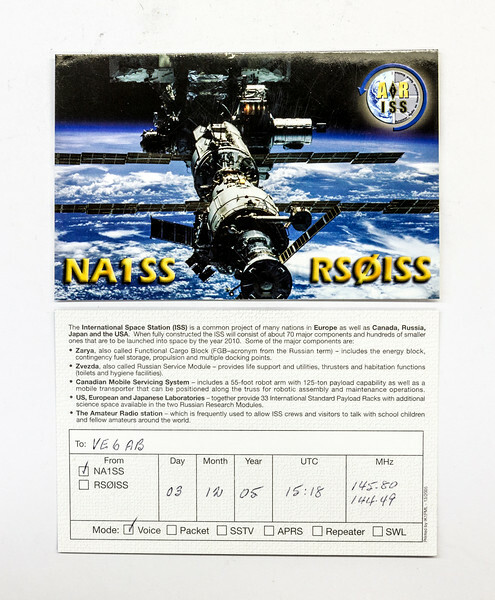 What you are seeing is the front & back of a NA1SS QSL card, one of the three confirmed voice contacts that I have made with the International Space Station, two from my mobile, and one from my ham shack at home. The other two QSL cards that I received, are similar to this one, but with different information and dates. Making a voice contact with the ISS. The following VHF frequencies are used for making voice contacts with the ISS. Most contacts with the ISS operations are split-frequency, using separate receive and transmit frequencies as shown above. Do not transmit on the ISS downlink frequency -- the downlink is your receiving frequency. The uplink is your transmitting frequency. Program your radio to listen to the downlink frequency and transmit on the uplink frequency only when the ISS is in range and ISS crew members are on the air. The crew on board the ISS are more likely to be available on Field Day, School Club Roundup, and JOTA. Also hams can sometimes make a contact with the ISS when crew-members are working on scientific research. I have found that sometimes a crew member will make a few random QSOs around the time of a school contact, before then setting the radio back to packet mode. The two contacts that I made with the ISS from my mobile were made under these circumstances. When the crew on board the space station are not making school contacts, the radios are normally left in packet (APRS) mode. If you have a Kenwood D710A, in the APRS Menu #612 (Packet Path) the “Type” should be “Others” and the "Path" should be “APRS,ARISS”. You do NOT want to use the normal path setting "WIDE1-1,WIDE2-1" as the ISS has a very large footprint that covers ALL of Canada and the US, and therefore you do not want your packets to be digipeated beyond the ISS. You will have to use similar settings to the one's I use with my Kenwood D710A with your APRS station of choice to work APRS via the ISS. to check and see if you have been digipeated by the space station, with your callsign having been placed on the map located there. All that is required to work APRS via the ISS is your normal APRS equipped mobile with included whip antenna mounted on your mobile. You will need pass-prediction software on your phone, and "The Heavens Above" or "AmsatDroid" phone app's are good choices without breaking the bank, and they also cover all the amateur radio satellite's in orbit and more. Otherwise use the link to AMSAT's pass-prediction page provided here. When you run pass predictions for the ISS you may find that the space station is passing overhead in the middle of the night in your part of the world. Be patient as sooner than later the orbit for the ISS will shift to daylight hours for your location. Over time, I have worked the various modes that the radios on board the ISS are operating in, including the times that the equipment is switched into repeater mode, with uplink at 437.800 MHz and downlink on 145.800 MHz, allowing you to work other hams across the country. Most of the time the equipment is in APRS mode, but for the times you discover the radios are in repeater mode, the following hints will help you be sucessful. Make sure your transceiver can transmit on the ISS uplink frequency. Adjust your transmitter frequency to correct for Doppler. Keep your modulation and deviation within the normal range for terrestrial repeater hardware. Use full duplex whenever possible to monitor your signal quality. Always be courteous. Please don’t monopolize the repeater. Once you’ve made a contact give someone else a chance. Activity can be heavy! Listen before transmitting to make sure you aren’t stepping on another station. Making a contact with the ISS is an exhilarating experience. But waiting for that coveted QSL card requires patience. Send your QSL cards or report including date, time in UTC, frequency and mode (voice) to one of the following addresses. To receive a QSL card, you must include a self-addressed, stamped envelope with proper postage. Once your contact information has been confirmed with the station log from the ISS, you may expect a QSL card in aproximately 6 weeks.